Why am I seeing ants inside my home when there’s snow on the ground? 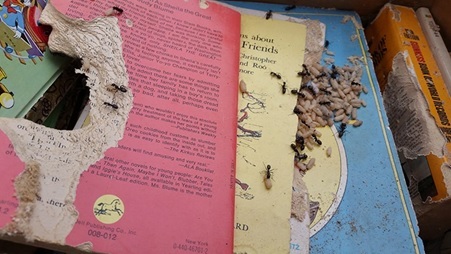 Ants can be a nuisance inside any home, particularly during the warmer months, however, homeowners may be startled to find ants inside during the winter months. Typically several species of ants primarily create colonies outside and only enter homes in search of food to bring back to the colonies. However, seeing activity in your home during the cold winter months is a sure indicator that there is a nest located in the home. Carpenter ants are one of the species that may make your home, their home. Carpenter ants typically build their nests within wood where they have chewed out galleries or passageways in the wood. They do not use the wood for a food source like termites, instead they are excavating tunnels in which to live, still they can cause serious structural damage to wooden buildings and homes. Carpenter ants are usually large and black in color, although some species may have combinations of black, red or orange throughout their body. These ants can be found in attics, ceilings, under floor coverings, cracks within walls, around door or window frames, shower or tub enclosed walls, as well as kitchen walls. Generally carpenter ants are most active at night while they search for food. During the warm months they feed on other insects or substances obtained from other insects, such as a sugary secretion known as “honeydew,” produced from aphids. However, during the colder months the ants remain largely dormant and only become active when temperatures become warm or if their colony is located near a heat source, such as a heating duct in the wall. Over the counter ant control treatments are not effective in controlling the ants seen in your home during the winter months because the ants are not interacting with other ants in the nest as they do in the warm months. For this reason, even baits which are often shared with other nestmates, will only affect the individual ant that consumed the bait. Cooper's One-Time Ant Control Service targets small nuisance ants and eliminates the populations in your kitchen, bathroom, or any other area they are being seen. We will create a protective barrier home by applying treatments to the exterior foundation of your home. In addition, gel baiting will be placed in discrete areas where ant activity is high indoors. Common placements for gel bait include window frames, pipe chases, and base boards. If you are seeing large black ants, this is likely carpenter ant activity. 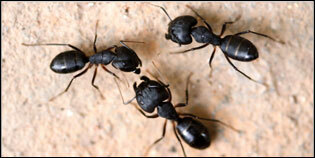 Learn more about our carpenter ant services here. Ready to get rid of carpenter ants? Schedule service online for fast technician dispatch by clicking the button below.